What do our youngest Israel Rider, an Arava Institute short-term study program, and Mennonites have in common? But first, they will spend an incredible few months traveling throughout Israel, Palestine, and Jordan. Levi’s parents, Lisa and Bill, both work for the Center for Justice and Peacebuilding at Eastern Mennonite University, and they are currently leading a group of twenty undergraduate students on a very nontraditional study abroad program. Spending no more than a few weeks in any one spot throughout the fall semester, they will be traveling to Jerusalem, the West Bank, and Amman studying the environment, politics, religion, Hebrew, and Arabic. Their trip includes living with host families in Bethlehem; picking olives on a sustainable Palestinian farm; hiking through the Galilee, the Golan Heights, and at Masada; riding camels in Wadi Rum; swimming in the Dead Sea; and volunteering at a Syrian refugee camp. Their first stop was the Arava Institute, where they spent three weeks in September learning about the environmental challenges that face the region and the cross-border cooperation that the Institute fosters. They also were fascinated to learn about green technologies like solar ovens and biogas generators, and to explore life on a kibbutz. 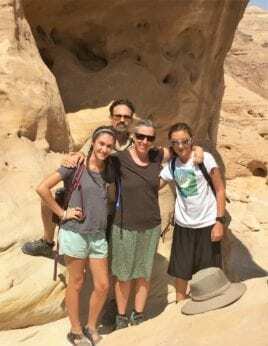 “The Arava Institute is a liberal arts education at its best: hands on in the fields, desert, and classroom,” Lisa writes in her blog post about their experience here. It was when they were planning their time at the Arava Institute that they first heard about the Israel Ride and hatched the plan for Levi’s unconventional bar mitzvah. Their identity as a multi-faith family—Bill is Jewish, Lisa is Mennonite, and they are raising their children in both religions—means that they are used to “nontraditional.” Miranda, their 17-year-old daughter, held her bat mitzvah at as an interfaith ceremony at Eastern Mennonite University. So far, Team “Levi Becomes a Bar Mitzvah” has raised 83% of their fundraising goal of $11,000. You can donate to them and find out more about the Israel Ride at israelride.org.